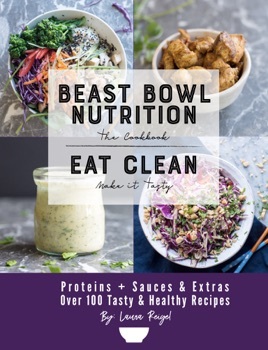 Beast Bowl Nutrition – The Cookbook is New and Improved Meal Prep. If you’re tired of the same old meal prep you need Beast Bowl Nutrition. This cookbook teaches you fast and easy meal prep strategies so you can save hours in the kitchen. You’ll find core proteins that you will keep on repeat, and when you pair those core proteins with the dozens of extras included, you have endless combinations of delicious, storable, packable food – food that you will want to eat! It’s time to ditch your tired, boring weekly meals. Beast Bowl Nutrition makes it easier to eat healthy. Learn exactly what to eat to put your diet and weight management on cruise control. The meal prep and nutrition chapters make sure you know what to eat, and give you a practical strategy for making each week’s meal prep easier than ever before. Every recipe is the perfect balance of greens plus protein and healthy fats. Beast Bowl Nutrition gives you a blueprint for starting a lifetime of healthy eating. Finding your healthy weight is all about balancing blood sugar and insulin. Every recipe in this cookbook is designed to balance the hormones that govern your metabolic fire. When you eat the right balance of nutrients your appetite and satiety cues work they way they’re supposed to work and you’re able to escape the perpetual cycle of obsessive calorie counting. You will find recipes like Steak Chimichurri, Chicken Satay, Buffalo Chicken, and even Tequila Lime Fish and Shrimp. Each recipe is paired with delicious salsas and crunchy slaws you will want to eat over and over again. There are also dozens of clean dressings like the Tomato Balsamic and Herbes de Provence Vinaigrette, even creamy Paleo Mayo and Chipotle Ranch. These healthy and guilt-free dressing and sauces will make sure you’re getting all the healthy fats you need. You’ll find over 100 whole food recipes that are gluten- and dairy-free, and every protein recipe has plant-based substitutions, making cooking for everyone a breeze. Eating healthy doesn’t have to be boring. You never have to feel deprived or count another calorie! Dig-in and finally figure out how eating real food for real is the best way to correct your appetite and finally find your true healthy weight. This cookbook is for you.